To a heat-safe pan, add Emulsifing Wax, Stearic Acid, Safflower Oil, Meadowfoam Seed, Apricot Kernel and Jojobo Oil. Heat over low heat until waxes have completely melted. To melted wax/oils add Shea Butter and stir until melted. If necessary, place on heat source to melt. With hand mixer, blend on low until ingredients have emulsified. Let product cool down and thicken up. Product can be placed in refrigerator to cool faster. When cool, stir mixture and briefly blend with mixer. Add preservative and fragrance and mix well. Add granulated sugar and mix in gently to incorporate. 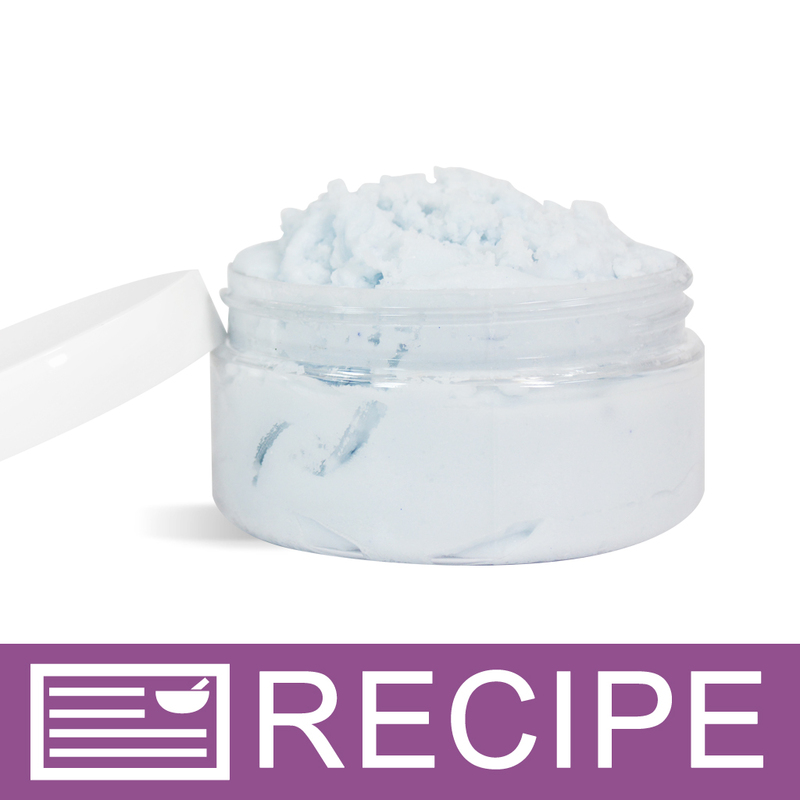 Add 1 scoop of blue powder and blend with mixer until product gets fluffy and smooth. Fill jars to approximately 6.3 oz. by weight. If more product remains divide up evenly. Apply lids. To Use: Massage onto wet skin and rinse off. 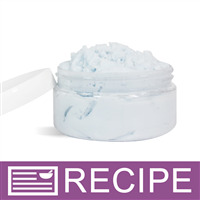 Ingredient Label: Sugar, Shea Butter, Emulsifying Wax, Stearic Acid, Safflower Oil, Meadowfoam Seed Oil, Apricot Kernel Oil, Jojoba Oil, Fragrance, Phenoxyethanol, Methylparaben, Ethylparaben, Butylparaben, Propylparaben, Isobutylparaben, Fluorphlogopite,Titanium Dioxide,Tin Dioxide, Manganese Violet. "What if I replace half the E-Wax with Cera Bellina Wax? will it make it creamy? I don't want it to be chunky." Staff Answer As long as the wax is melted completely, it will not be chunky. 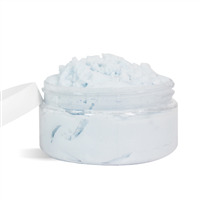 It may give the product a more softer, creamier texture than the traditional E-wax. "Is there another ingredient that i can substitute the ewax with? or may I omit it? I have everything but this ingredient and i want a scrub that is thick like this one claims." Staff Answer You will not get a thick product without the e-wax. You can try adding beeswax instead of the e-wax. "I do not have Germaben on hand, can I use optiphen or phenonip instead? " Staff Answer Those will work. Staff Answer Two years from the time it is made. "Can the stearic acid be omitted or substituted for something else?" Staff Answer We love it when customers substitute ingredients to make their own formulas. We have not tested this recipe without stearic acid.